Summary: Determining the status of marine turtle foraging habitat and identifying habitats essential to maintaining the viability of the species were listed as Priority 1 tasks in the Kemp’s ridley recovery plan (USFWS and NMFS, 1992). This study will provide information on an in-water aggregation of Kemp’s ridley turtles that is essential to their conservation and protection of their developmental/foraging habitats and these tasks were assigned to FFWCC as indicated in the aforementioned federal recovery plan. 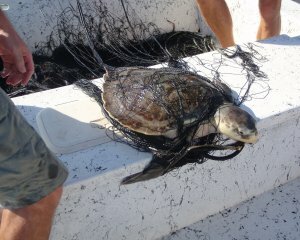 The project has broader significance in that the resulting data is obligatory for improving the existing management strategies to protect marine turtles and their habitat in the Charlotte Harbor National Estuary and the Pine Island Sound Aquatic Preserve, as well as other regions of western Florida. Additionally, the study will provide data to assess the potential impacts to marine turtle developmental habitat from storm water management in upland areas (i.e., release of Lake Okeechobee water via Caloosahatchee River) and petroleum exploration/extraction in offshore waters. Results: Estuarine food webs are complex and often have multiple inputs of organic matter (terrestrial plants, seagrasses, macro- and microalgae, marsh plants, and phytoplankton), making data interpretation difficult (Michener and Kaufman, 2007). Furthermore, these systems usually experience seasonal variation in freshwater inflow and the Caloosahatchee River watershed is impacted by a variety of water quality problems including anthropogenic nutrient loading and inflow alterations. Decapod prey of Kemp’s ridley turtles in the Charlotte Harbor estuary demonstrated temporal and possibly spatial variation in their isotope signatures. Spider crabs exhibited more depleted δ13C values during the dry season compared to the preceding wet season, suggesting a seasonal shift in the source of dietary carbon. The seasonal pattern was less pronounced in Kemp’s ridleys. The correlation between δ13C and δ15N for blue crabs purchased at a local market was similar to a pattern reported by Bucci et al. (2007) whereby δ13C increased significantly with increasing salinity from upper to lower regions of an estuary and δ15N increased in the upper reaches with high nitrogen input from anthropogenic sources (i.e., agricultural and/or municipal wastes). Sessile invertebrates collected in Pine Island Sound also displayed discernible variation in their isotope signatures, with an unidentified sponge and a tunicate (Molgula) collected in the wet season having heavier δ13C and depleted δ34S values compared to that of a tunicate (Styela) collected in the dry season. Analyses of the isotope data presented herein are preliminary but the study itself is one of the first and most comprehensive investigations into the trophic ecology of Kemp’s ridley turtles inhabiting nearshore foraging grounds. A more detailed examination of seasonal changes in primary production is needed to characterize the food web in the Charlotte Harbor estuarine complex.